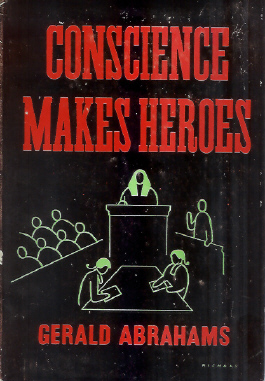 Kalahari Books - Conscience makes heroes. Home Kalahari Bookstore Crime Conscience makes heroes. Publisher : Eyre & Spottiswoode. First edition with green cloth covered boards andBlack embossed spine title. Slight stain on front board. The corners and spine are lightly bumped. The ex owners stamp is on the end papers, otherwise the interior of the book is clean and firm. The cover is lightly rubbed, and has edge creasing.